We’d love your help. Let us know what’s wrong with this preview of Fooled by Tali Nay. 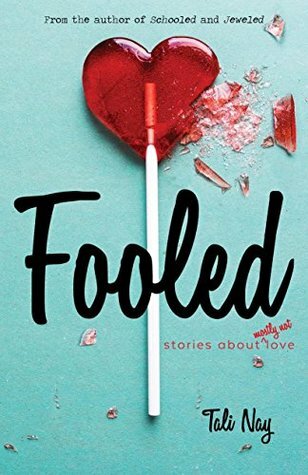 To ask other readers questions about Fooled, please sign up. For this reader, the publication of Fooled makes it a Triple Crown for the author. As in her two previous works, Schooled and Jeweled, she under promises and over delivers. Yes, some might ask “what is so special about her love life” that would make someone want to read about it? For me, though, this book isn’t merely about her trials and tribulations but, rather, of ours as well. Despite a clear age difference and generation gap (not to mention a difference in chromosomes), I can identify with w For this reader, the publication of Fooled makes it a Triple Crown for the author. As in her two previous works, Schooled and Jeweled, she under promises and over delivers. Yes, some might ask “what is so special about her love life” that would make someone want to read about it? For me, though, this book isn’t merely about her trials and tribulations but, rather, of ours as well. Despite a clear age difference and generation gap (not to mention a difference in chromosomes), I can identify with what the author has gone through because I’ve been there myself. You probably have, as well. Laugh out loud funny in some parts, heartbreaking in others, this memoir about finding love is beautiful and perfect for reading on Valentine's Day (which I did...). I loved the in-between parts when the author would quote from her survey and then add some musings on love and what we all look for in The One we love. And then of course the stories, all those wonderful stories. She is a gifted writer and it made me think a lot about my own life and love. Great book, Tali! I was sure I knew exactly how I’d rate this book....but I loved it more than I thought. This book is a great look at love and loss, how we find love and looking for The One. Tali does a great job pulling from her personal experiences and helping the reader reflect on their own. Another wonderful read! A beautifully written memoir about the struggles we all experience to find love. Funny, heart warming accounts of the author's past relationships will have you rooting for her (and all of us) to find The One.